On 23 April 2019, a festival of Indian culture will be held at Tomsk Polytechnic University. The workshop Smart Tomsk-2019: foreign students’ image into the international street-yard was held on 30 March 2019 at the Business Incubator of TPU. 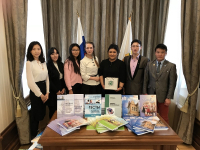 A meeting of the Uzbek delegation headed by the Consul General of the Republic of Uzbekistan in Novosibirsk Yusup Kabulzhanov with students of Tomsk was held at TPU. The National Lounge of East, South and Southeast Asia will be held on 15 November at the International Culture Center of TPU. A festive celebration of the Day of Knowledge was held for TPU freshmen. The School of Core Engineering Education is the School to educate most international students of Tomsk Polytechnic University. Among graduates with honors'18, there are 122 bachelors, 25 specialists, and 495 masters. 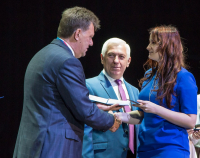 Tomsk Polytechnic University hosts the 8th All-Russia Conference Scientific Initiative of International Students and PhD Students of Russian Universities. International students from all Tomsk universities are invited to participate in the dictation.